English Product EZ Smart Pen? provides a wireless and long distance operation. students to speak English with fluency in real-life. · Designed to suit various multimedia environment. · Contents are suitable for Ubiquitous environment. WHAT is EZ Smart Pen? eager to learn, and want to study even more. pronunciation, and watching fun animations. · Usable on any PC. · All the newly being developed EZI programs will be available in bookstores. · Free upgrades without any downloading size restrictions. · Easy installation with a CD. · Users can view videos anywhere with the EZI program installed computer and supplied wireless USB. 1. Install the EZI Program from a CD on the computer. 2. Click EZI Program and start installation. pop-up sign for“new device has been connected”. 4. Switch on the EZ SMART PEN. 5. Touch the image with EZ SMART PEN. 6. Switch off after use. · Charging-easily rechargeable with cell-phone charger. Users have the choice to select video mode, or voice mode. 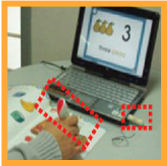 enjoy over 300 EZ SMART PEN learning experiences. program will automatically start installing. Once installed, you don’t need to re-install again. 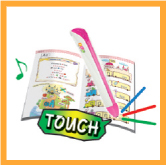 Voice Mode : Turn on the power on the pen, and touch the content. You are now ready to enjoy. · Provides various video based materials and contents reflects well organized education curriculum. · EZI programs can be re-programmed to suit the contents and structure of the program.